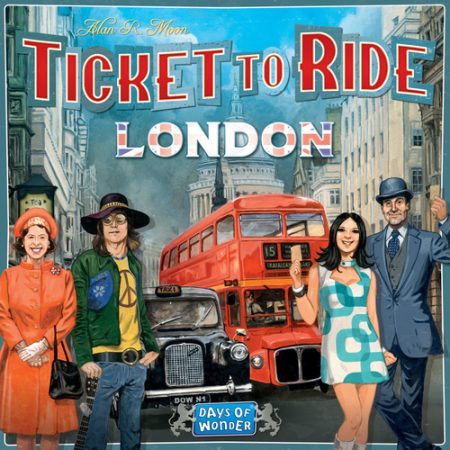 Alan R Moon is releasing yet another game for the Ticket to Ride franchise, this time Ticket to Ride:London. Read about it here. Do it. Days of Wonder has announced Ticket to Ride: London, which is a scaled down version of the original, much like Ticket to Ride: New York, but set in 1970s London. The Ticket to Ride: London board looks simple enough. 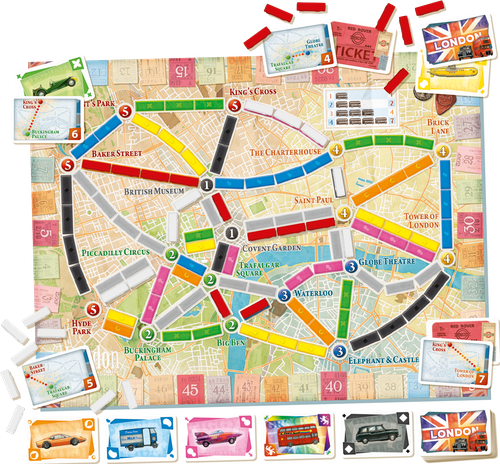 Ticket to Ride: London supports 2-4 players, and will take about 10-15 minutes to play. The game is due in June for Europe, which will have versions in English, French, German, Polish and Italian, and US customers will have to wait to July. There will also be editions for the Japanese and Brazil markets, among many more we're sure. Ticket to Ride: London builds on the excitement of Ticket to Ride: New York. It's slightly bigger, but it feels more wide open, and the new Bonus balances the board and the tickets. Ticket to Ride: New York had taxis, so naturally Ticket to Ride: London has double-decker buses. The retail price should be around 20 euros/dollars, and if you haven't tried Ticket to Ride: New York yet, you can pick it up here, the price should be the same. Go ahead, do it.